I am Khafre K. Abif, AIDS Activist and I have been thriving with HIV for 26 years. I have an anthology, Cornbread, Fishand Collard Greens: Prayers, Poems & Affirmations for PeopleLiving with HIV/AIDS which was released in early September 2013. God is not through with me yet. To that end I am now working on a second anthology. Call For Submissions: A Pastors Prayer for People Living with HIV/AIDS. A Pastors Prayer for People Living with HIV/AIDS a collection of prayers, for the people living with HIV/AIDS. This project seeks inspirational prayers that opens the heart, supports the soul and uplifts the spirit of people living with HIV/AIDS. I believe that there is healing in prayer. I know that words have power. I needed to provide this collection of words that will combat the words that are so often hear spoken to someone with HIV. This is my effort to help combat HIV-related stigma. AIDS-related stigma and discrimination refers to prejudice, negative attitudes, abuse and maltreatment directed at people living with HIV and AIDS. The consequences of stigma and discrimination are wide-ranging: being shunned by family, peers and the wider community, poor treatment in healthcare and education settings, an erosion of rights, psychological damage, and a negative effect on the success of HIV testing and treatment. The idea for the anthology grew out of my work as an HIV Test Counselor. Each time I had to share with someone that they tested positive for HIV one of the first issues for them was disclosure. As you are reading this it is quite possible that you know someone living with HIV/AIDS. If you do then they have shared their status with you. Let us consider all of those who still haven’t disclosed to their mother, father, sister/brother or even their faith community. What place to they go to as a source of support and inspiration? Editor: Khafre K. Abif Submit to: apastorsprayer@gmail.com Please include bio on separate document Deadline: Submissions will be accepted through August 15, 2015 Goal: 730 prayers, 365 for the morning and 365 for the evening Guidelines: Submissions from faith leaders Intercessory Prayer for the morning and/or prayer for the evening There are no themes, no restrictions. Send two of your best work. On a separate sheet, include Name, Email, Phone Number, and Title(s). Place prayer(s) on separate sheets. Please include identifying information. Join the virtual book party! "Why do you (activists) care so much what other people think about you! Just be you and ignore everyone else!" On the surface this seems like great advice, we should all live secure in the knowledge of our innate self worth and any one who disagrees can take a long walk off a short pier! Heck yeah! "What other people think of people like me, gets people like me killed"
Even with the amazing victory of marriage equality in the USA, many, many LGBT people are still vastly unequal and live in danger. 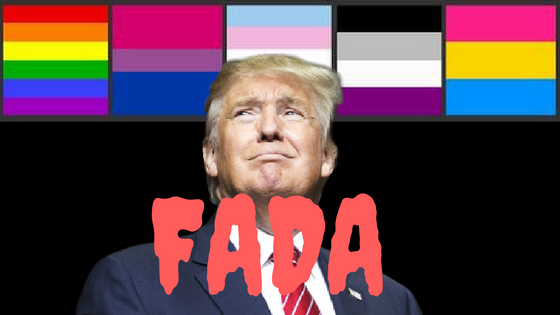 This danger is compounded as a bi who is also trans. 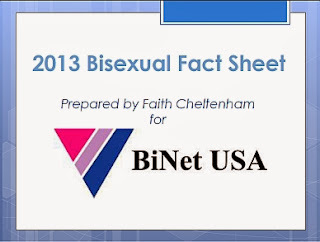 Bisexuals are often exiled from the broader "gay" community, as well as having to deal with violent biphobia and homophobia from straight people. Adding onto this stress is being transgender or gender non-conforming and you have a huge target painted on your back that doesn't just say "kick me" it says "kill me". That death can range from a straight up murder, in a horrible grisly way or through callous disregard by the "gay community" and health/mental health professionals. Already this year we have lost several bisexual teens, half of which were trans, to suicide. What others thought of them, the negative, poisonous thoughts,the isolation and pain, directly lead to their deaths. It is a privilege to not care what other people think about you. It is a privilege that is denied bisexuals. So every time the media latches onto some salacious bi themed story, every media depiction of us as cheaters, indecisive, secretly gay/straight, every one contributes to the climate of thought that ends with out deaths. That is why I care. Because what others think has a powerful influence on reality. It can turn the tides towards justice and equality as we say with the marriage decision, and it can lead to our deaths.